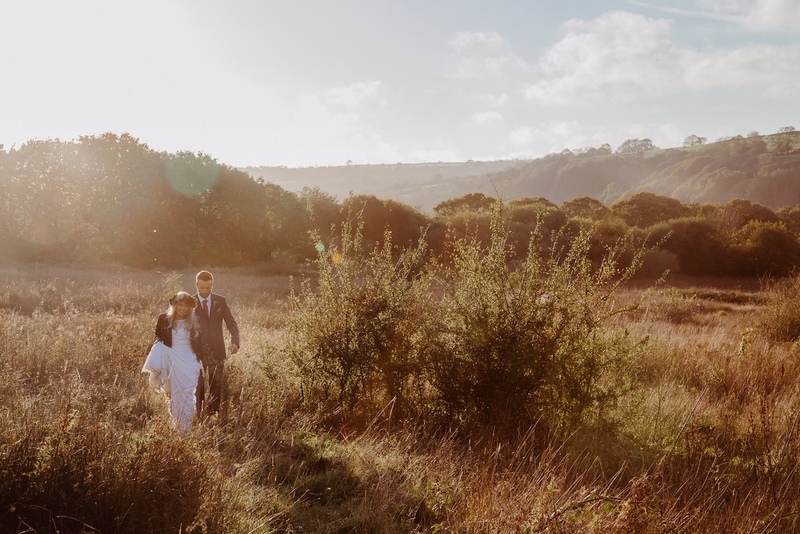 When Hannah from When Charlie Met Hannah got in contact with us we just knew that we wanted to be able to showcase this most awesome wedding video from Kelsey and Andy’s beautiful wedding in Cilgerran, Wales. Kelsey and Andy’s stunning outdoor ceremony was held at a quarry in the forest at Fforest Farm followed by a gorgeous teepee reception. The couple met each other while on separate ski holidays in St Anton, Austria. With a clear love of the snow, snow sports and the outdoors it was lovely to see nods of this throughout the decor and styling! Kelsey- Sarah Wickham, our celebrant, was perfect, she gave us so many opportunities to meet and discuss what sort of moments we would like during our ceremony. Lighting a candle for our loved ones who couldn’t be present was one my most treasured moments. Sarah was the most humble and amazing person we could’ve imagined to lead the most important part of our Wedding day. We wished to put a letter in a bottle to then open at a treasured moment in our futures- and it went a little wrong during the day- when we had in fact misplaced our letters- Sarah continued and even brought us our own special bottle to put our letters in when we found them. I would also add that Sarah helped out so much on the morning of the wedding. Honestly the hours before the wedding she could not have been more helpful, also Sarah’s calming influence is everything you could want on your wedding day. And how about your reception? Kelsey- Fforest farm, I can’t even begin to explain the amazing features of this venue. Not only is the day run by super relaxed yet enthusiastic team members but it is one of the most beautiful places I’ve ever been. Being able to have access for our entire wedding party to enjoy the whole surroundings for our wedding weekend is more than we could’ve imagined. The food, the vibe, the indescribable nature, the people, everything was just perfect! The venue was very fluid and open. We had the teepee where the band played and the first dance was etc. We also had a pub on site that was 50 yards from the teepee, a large terrace, a large seating area around fires and fire pits. So this enabled everyone to enjoy the evening however they wished to. Did you have a specific theme for your day? 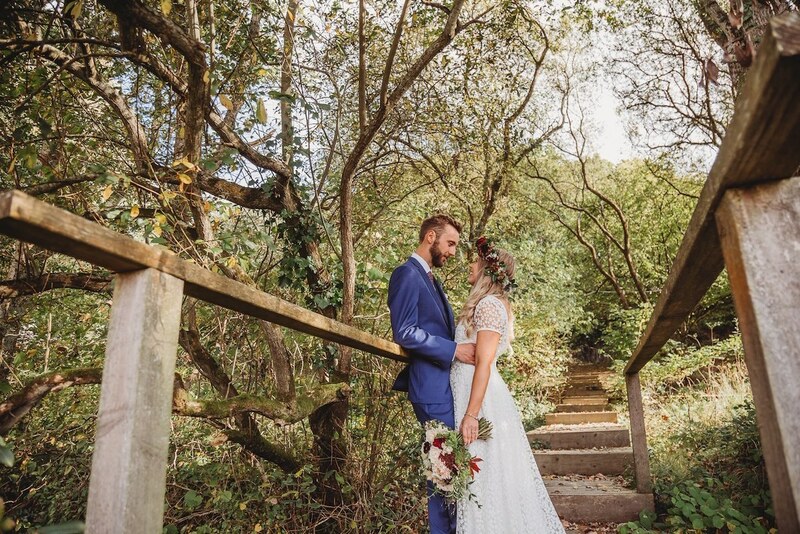 We wanted there to be a very natural theme, the outdoors was the unwritten theme as the venue was in a forest and the accommodation was camping style. So we encouraged slightly warmer clothes as well as advising against any outrageously high heels! The dress was from Rachel Burgess bridal boutique– created locally in Wales by E&W couture. 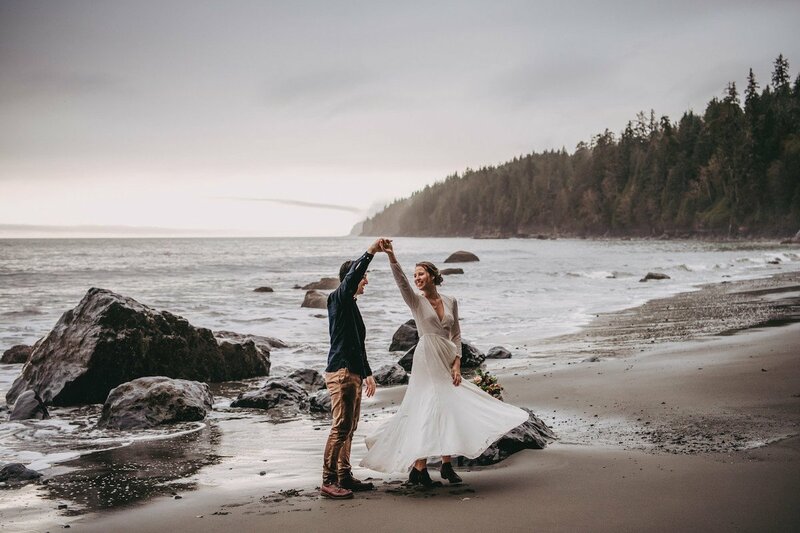 The dresses name was Isla and we believe she completely fitted the outdoors vibe of our wedding. They are the most beautifully made dresses and the love of locally hand made items always shine out to me. My dress was a dream- it took a few shopping outings with my Mum to finally stop by the boutique. I tried a few styles on as was undecided and then on trying Isla- she just felt comfortable and I felt happy and my Mum could see that in me. I had a lovely train sort of thing and looser cuff sleeping- Sophie (E&W) bespoke LG makes them. The little Daisy’s across the dress made me feel all forest themed myself and added a lovely warmth to the dress. I was so comfortable all day- I was swinging on tree ropes and dancing all night! I also had a Pandora bracelet from cousin for the day, which had memories our family and my Grandad and the garter my mum wore at her and my dads wedding. I wore a flower crown, which was one of my favourite additions and was the idea I had from right at the beginning- it was all I pictured and more. My new vegan maroon DM’s also made an appearance into the evening too! Oh my, I can’t forget my jacket by The Mermaid Effect. It was exactly as I’d imagined- she took me through the whole artistic design phases- I honestly felt like an ethereal rock star! 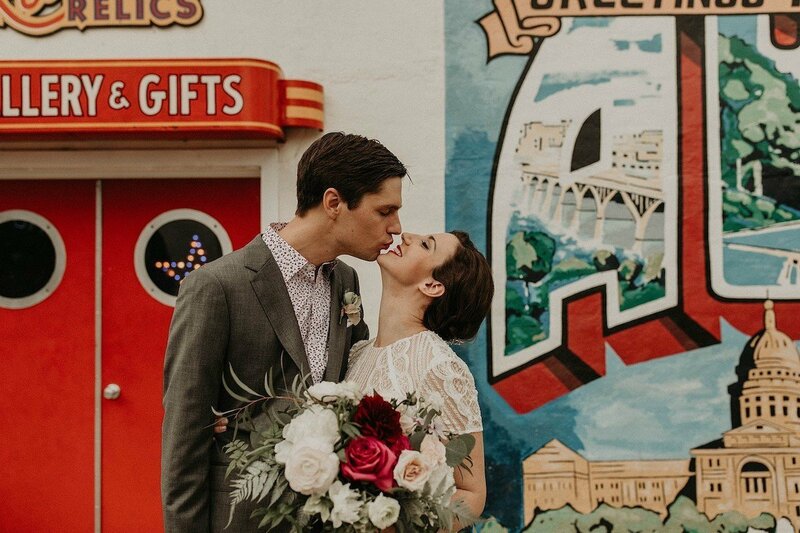 Tell us about the decor and details? Kelsey- Billie Bryant created our invites and we had a few lovely people who created beautiful decor to our outdoorsy venue- my bridesmaid Erin’s mum helped with the table plan, my mum and dad wrote on our table names and we had a beautiful ski theme cake- it included the runs on the slopes we met and a Jaeger centre to one part. Another addition to the day were woolly hats for decor (by Andy’s sister in-law), Jaeger bottles filled with fairy lights and decorated to our theme and dream catchers hung in the forest and lodge. We had hand written name cards, a scratch map of the world signifying where tables were and seating arrangements, we had a toast of a rum which reminded us of our camper van travels during the ceremony, a personalised book made by our pal – where people could write a message and then print of a Polaroid photo. For our flowers we spoke to Linda Screen- The woodland farm, about ideas and sent Pinterest photos across. All I knew I wanted was an autumnal theme of local followers. We wanted the wedding to be as ethically friendly as possible. Linda was so relaxed and helpful and did everything we mentioned and more! She also created confetti baskets of herbs with sentimental meanings- we couldn’t have been happier with our floral decor. We are so thankful to everyone who helped create our dream wedding. Andy- We had a band called Revolverlites who were awesome. They had a classic après ski vibe that worked perfectly with the venue and our taste. Our first dance given my sub standard dance skills was entertainment in itself. We had a hula hooper who performed for us as well. Where did you save money and how did you splurge? Andy- Not sure we really saved too much money as we went over our initial 15k budget, but the cake was organised by Kelsey’s mum so this saved us money. We didn’t have a starter as we just felt it was unnecessary given the volume of food throughout the day. We went for quality of photos/videos and researched a lot. We spent a lot on the venue just because it was perfect, and when you know a place is right then I don’t see another option but to go for it. We did have quite a large number of guests for the whole day, but again this is a major part of what made the day so special. 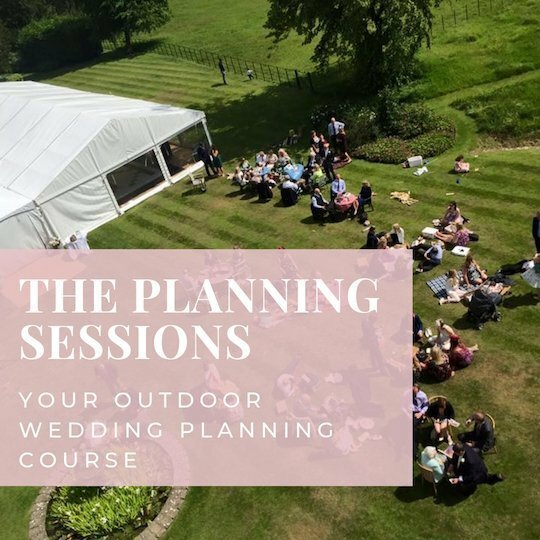 What are your top tips for other couples getting married outdoors? Andy- Expect it to rain, if it rains it will still be the best day of your life! You will just have different memories and stories; don’t think the weather could ever take away from your day. If the sun shines then that’s a bonus, but we learnt to not fixate on the weather. Make sure everyone knows that it will be mainly outdoors, just for dress code and comfort. Apart from that just have a contingency plan just in case it is severe rain or wind, but I honestly do not feel that the weather could have taken away from our day, it just would have given us different photos and stories! 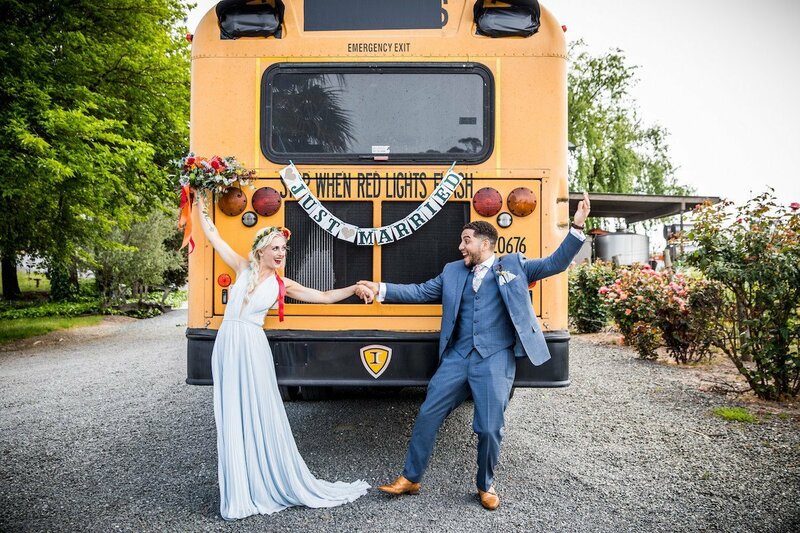 We would once again love to thank When Charlie Met Hannah for sharing their work with us and of course a HUGE congratulations to Andy and Kelsey. It looked like an absolutely incredible day. P.S Are you a videographer with a wedding story to share with us? If so be sure to get in contact with us here as we’d love to speak to you!